In October 2014, EEDAR evaluated the progress of the Steam Early Access program a year and a half after its March 2013 launch. We found that while the service was exploding in popularity, only 25 percent of Early Access titles had been released as full games. The full game release rate was not significantly higher for the initial titles in the program (e.g. only 33 percent of titles from the program's first month had been released), raising the question of whether the program would eventually see a backlash from gamers if the percentage of titles reaching full release did not increase. 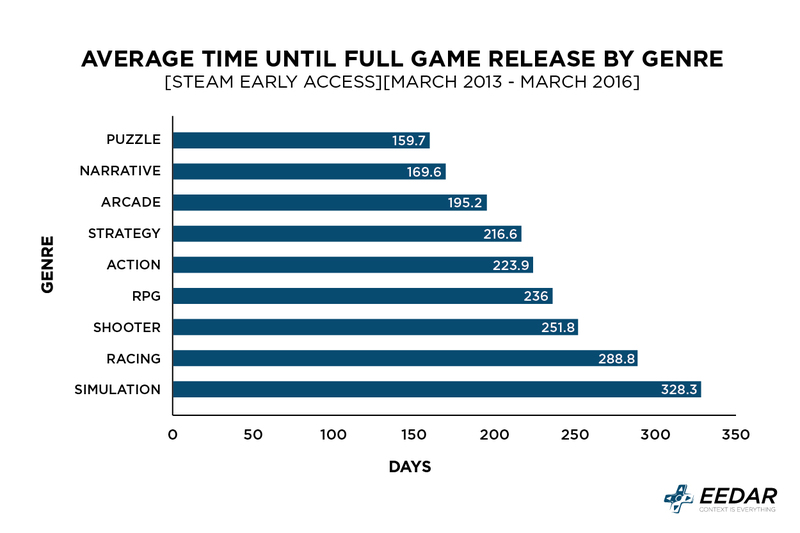 March 2016 marks the three-year anniversary for the Early Access program, and an updated analysis suggests that Early Access is hitting its stride. The popularity of the program for publishers continues to grow rapidly, and the majority of the titles released as Early Access in the first two years of the program have been released as full titles. 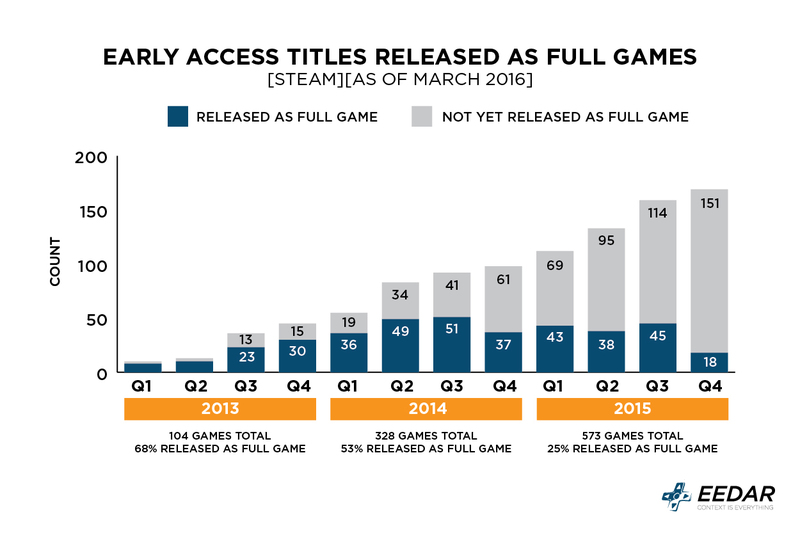 The number of Early Access games released each month continues to grow rapidly. As of March 2016, more than 1100 games have entered Early Access. In addition, most of these titles are eventually reaching a full game release. Almost 70 percent of the titles that appeared on Early Access in 2013 have been released. An apples-to-apples comparison of the first 18 months and second 18 months of the Early Access program suggests that the length of time titles are spending in Early Access is decreasing. However, as Early Access matures, it's becoming clear that gamers who purchase an Early Access version will likely have to wait a long time for the full release. The number of publishers who have used the program and launched a full release within two months (similar to a paid beta) has hovered around five percent for the length of the program. The average time to release of the 391 titles that have exited the program is over seven months. The average time to full release for titles that entered Early Access in 2013 and 2014 is over a year. So how long will it take for the game you purchased to be released as a full title? It depends a lot on the genre. Games in the Puzzle, Narrative, and Arcade genres spend significantly less time in Early Access than titles in the RPG, Shooter, Racing, and Simulation genres. This could be at least partially attributed to the additional balancing required for multiplayer-focused Shooter and Racing games, or the complexity of bug testing RPGs and Simulation titles. Thus far, Early Access has been a win-win for developers - they gain upfront revenue during development, grow their user base, and get feedback from the consumers who are most passionate about their game. In addition, despite the long time these titles are spending in development, the program continues to grow rapidly. The program is cementing itself as a viable path for PC releases. It will be interesting to see how the platform continues to evolve, especially if the popularity continues to increase and discoverability becomes more and more of an issue. Working with Patrick to surface these kinds of data sets is a blast. There was an additional point in discussion internally that I'd like to present here. Currently Sony and Microsoft have only dipped their toes in this market. Microsoft with Game Preview and Sony with their (as of now) unbranded Early Access program, with a handful of titles to date between them. With three years of data behind Steam Early Access and our analysis showing an increasingly viable market, the first party's should hopefully feel more comfortable proceeding forward with expanding their own Early Access programs on their respective storefronts.